In September 1938 Britain's Prime Minister Neville Chamberlain flew to Germany repeatedly to try to negotiate with Hitler and to maintain peace in Europe. In September 1938 Britain's Prime Minister Neville Chamberlain flew back and forth to Germany to negotiate with Adolf Hitler. He hoped to guarantee "peace for our time". He agreed that Germany could take over the Sudetenland in western Czechoslovakia, as part of a policy known as appeasement. 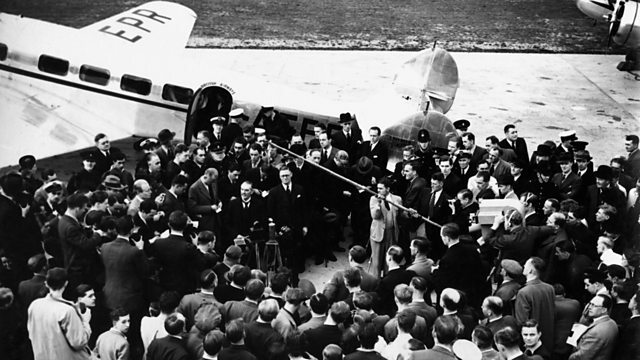 Photo: The Prime Minister meets the press on his return from his first trip to Germany on September 16th 1938. Copyright: BBC.